Tortilla chips were initially an afterthought, a simple snack made with leftover tortillas. But these crispy triangles of deliciousness soon became a nationwide sensation, and each February 24, we celebrate these salty snacks with National Tortilla Chip Day. Whether you eat yours plain or dip them in a spicy salsa, tortilla chips bring the fiesta to any occasion. You can buy really good tortilla chips at your local market, and of course, some of the best ones can be had at the Mexican restaurant down the street. But did you know tortilla chips are very simple to make at home? Heat some oil, cut up some tortillas, fry, and enjoy. Stop by your local grocery store and grab a bag of tortilla chips with some guacamole (or salsa). Sometimes, we enjoy these delicious chips by ourselves. No shame in this chip game. Tortilla chips are the perfect party food, so throw them a big party! Host a fun night with friends and family, and have each person bring her favorite type of tortilla chip and salsa. There are blue corn chips, organic, salted, unsalted, and many more. Chip chip hooray! 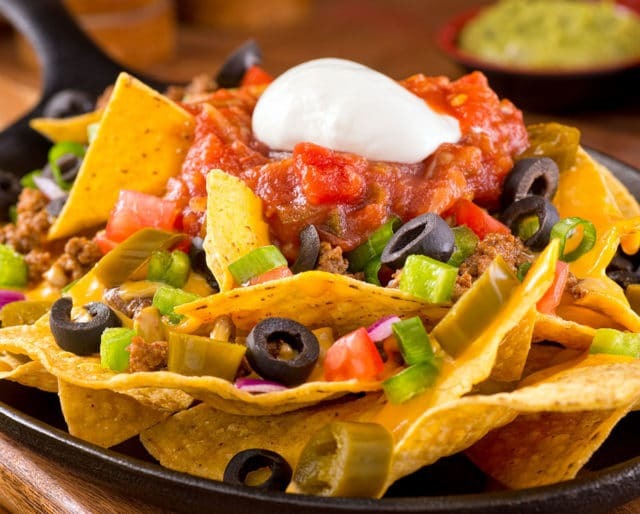 Nachos without tortilla chips is just a gooey mess. Tortilla chips make the dish, and this dish is one of the best foods in existence. This alone makes the tortilla chip a national treasure. Mild. Medium. Strong. Corn. Peach. Chunky. Thin. The salty, crispy tortilla chip complements each of them, bringing out their unique flavors — and bringing them to our mouths.